Frequent travellers won’t be surprised that airports raise blood pressure. Planes are late, the overlays are long, security personnel are nasty, waiting lines are long, or you run into some other problem that you can’t anticipate ahead of time. But, according to a new study, published in The Journal Occupational & Environmental Medicine, it turns out that airports can raise your blood pressure even if you don’t travel. It’s been established in previous studies that living around loud airports raises blood pressure. High blood pressure can lead to stroke, heart failure, heart attack and kidney failure. It affects more than a billion adults worldwide. Is It Really the Noise from Airports Raise Blood Pressure? But is it really the noise or something else that causes it? That was the answer a team of Greek, Dutch, and British scientists wanted to know. The research team showed that people living for at least five years near a busy airport and under a flight path have a greater risk of developing chronic high blood pressure, also known as hypertension, than those who live in quieter areas. They approached participants who lived near Athens International Airport from 2004 till 2013 to check the hypertensive effects of airport noise over time. Based on people’s addresses, they calculated the exact decibels (dB) of noise to which they were regularly exposed. Because other types of noise are present during the day (like traffic, construction, music, and so forth), they focused on night time noise specifically. 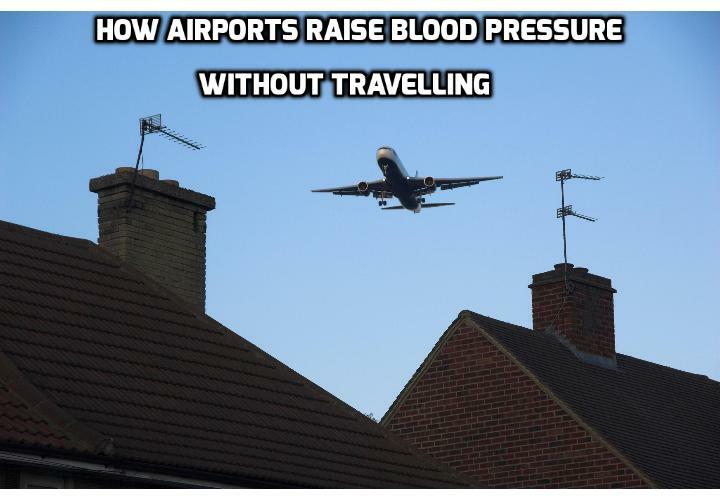 In What Way Do Airports Raise Blood Pressure? Researchers found that their subjects were 2.6 times more likely to have high blood pressure with every 10 dB increase in night time airplane noise. They used digital recorders to determine what noises had the biggest impact on blood pressure, ranging from road traffic to a partner’s snoring to an airplane taking off or landing. The Decibel level, not a sound’s origin, was the key factor, but airplanes had the most significant impact, according to researchers. Since they also gave their subjects a questionnaire to measure the amount of irritation they experienced because of the noise, they could also conclude that the aircraft noise increased blood pressure even when people were not specifically annoyed by it. This study proves again that stress is the main cause of high blood pressure. Loud noise is just one of many stress factors that cause high blood pressure. And in most cases, it’s unconscious. I call this “sensory stress”. Other stress factors are emotional, mental and physical stress. CategoriesPersonal Care and Health Tagsairports raise blood pressure, control blood pressure, stress and high blood pressure.